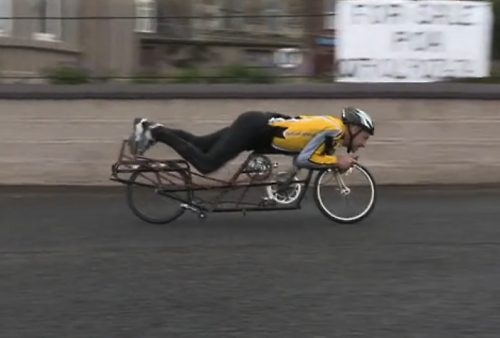 Flying Scotsman Graeme Obree is the new World speed record holder for cycling in the prone position. The 48-year-old has been competing at the World Human Powered Speed Challenge at Battle Mountain in Nevada, and posted 56.62mph through the 200m speed trap to take the record. Obree's chin rests less than an inch from the front tyre, and the shoulder supports are made from a repurposed saucepan. One of Obree's major innovations was to use push levers instead of a circular pedalling motion. The bike ran a maximum gear of 290 inches for the record attempts. Battle Mountain is a favourite location for human-powered speed attempts. The road allows riders an acceleration zone of up to 4 miles before being timed over a 200 meter seciton. The road was also resurfaced in 2009, with a smooth surface specially prepared for human powered vehicles. Obree was scheduled to have another attempt at that record in Vortex, the back-up bike of the University of Toronto team who are also at Battle Mountain. However, he has abandonded that attempt now after several test runs of the unfamiliar machine. Speaking to The Daily Record, Obree said of his record breaking weekend, "I don’t feel a sense of failure. I came away with a world record and it has been a privilege to be taken into the heart of this community of cyclists.